With a seven-year-old son diagnosed with autism, Grand Rapids Public Schools parent Deanna Wilson has some special challenges. She’d been educated by doctors and counselors over the years about her son’s special needs, but never received much advice on how to help him navigate the increasingly rigorous academic requirements at school. That’s where the district’s Parent University was able to help by offering a class providing advice for parents of autistic children. In its second year, Parent University offers a huge range of classes. They help parents help their children with math, science and English, and even issues outside the school building that affect their education. Wilson said her 16-year-old son had neighborhood friends who were tempted to get involved with gangs. Another parent, Alecia Haven, said her favorite part of Parent University are the Kahn Academy online classes that give her the tools to help her children with math and science. Haven said the beauty of Kahn Academy is that it meets students at their level of understanding of a given subject. Noting there are classes on cooking and creating healthy menus, Haven added she and her daughter took an aerobic dance class together that gives them some special time together and a good workout. Wilson and Haven say what drew them to Parent University is that it was designed by parents, for parents, and is a sign the district is listening. Mel Atkins II, the district’s executive director of community and student affairs, said the program was designed to do just that after consulting with a parent subcommittee. Parent University online programming is becoming popular, too. Online courses were introduced in October, he said. Since then, more than 12,000 visitors have completed some 1,700 courses. 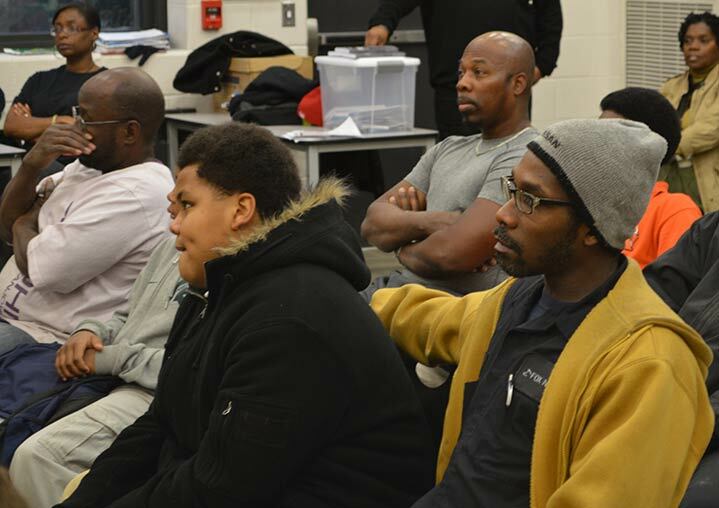 At a recent morning meeting at Alger Middle School, designed especially for dads, an inspirational speaker sparked a conversation about school safety laws that bar former felons from volunteering at school. A program coordinator told the group a class on personal finance would include a component on how some felons can be allowed to volunteer. All Parent University classes fall into one of four categories including effective parenting, navigating the educational system, personal growth and development and health and wellness. What parents and administrators especially like about the concept is that it’s available to anyone, even parents outside the Grand Rapids Public Schools.